Pumpkin rolled oats cookies with white chocolate and macadamia nuts. While I was looking through pumpkin recipes recently, I came across the idea of pumpkin chocolate chip cookies which sounded so good that I had to try them right away! I had not thought to use pumpkin in cookies before but I knew that it would be a killer combo. When I went to see if I had any chocolate chips, I happened to stumble across some macadamia nuts first. I looked at the container and thought, I have just enough for a batch of cookies and then inspiration struck! Why not add pumpkin to some white chocolate chip and macadamia nut cookies? White chocolate chunk and macadamia nut cookies are my all time favourite cookie and so with that thought I instantly had a new plan. I pulled out my trusty white chocolate and macadamia nut cookies recipe and I proceed to add some pumpkin puree . Since the pumpkin puree would be adding some moisture I figured I would need some more dry ingredients to balance things out. I was going to just add some more flour but then I thought; Why not add some rolled oats? Rolled oats add a great texture to cookies and they provide the perfect excuse to lie to yourself and say that that makes them healthier. 🙂 I have to say that the aroma of the pumpkin and white chocolate baking in the oven was heavenly! When I first bit into one of the cookies, they definitely lived up to my expectations, taking an already fantastic cookie and elevating them to even further heights! Bake in a 350F/180C preheated oven for 8-10 minutes. Lord have mercy on my taste buds! I don't care for pumpkin but this one I'm going to try….MmmmM! I love this combination kevin! So many fabulous pumpkin recipes around at the moment, but these have really got my tastebuds dancing! These look like a must-try! Yum!! What a great idea! This will be my next cookie on baking day. Can't wait. Ooo I'm convinced..these are on my baking list for tomorrow!! Sounds like you were truly inspired! As for your cookies, they sound like a dream. those cookies look amazing! i love the pumpkin and white chocolate combo. i made a similar cookie a couple of weeks ago, but i removed the moisture from the pumpkin by cooking it on the stove first. Genius! I'm officially enamored with these. Kevin, you managed to take one of my favorite types of cookie (white chocolate macadamia nut) and add in my obsession (pumpkin)… it's just too much! Actually, it's just right :). I will have to make these sometime soon. Those look and sound so good! Great combo of flavors – anything with those ingredients must be amazingly good. Oh my gosh, YUM. These look FaBuLoUs!!! I might have to make these ASAP! Oh Kevin you have done it again…,simply outstanding cookie idea. Looks delish my friend! I think I just found something I'm bringing to the Thanksgiving spread, thank you! Did you use bakers white chocolate or a white chocolate bar? these look amazing must try soon! As I was making these today I noticed that you did not say when to add the pumpkin into the dough…..I just put it in after the egg! Thought you might like to know so you could fix it! 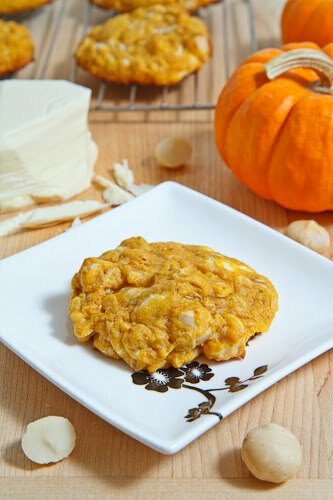 Pumpkin and white chocolate is a wonderful flavor combination. Love these! Tiff: Either good quality baking chocolate or a chocolate bar. This time I used a big brick of Callebaut. The DeL Sisters: Good catch! I have fixed the recipe. Yay! I have another pumpkin recipe to try out this season. Thanks for this 🙂 They sound heavenly! Mine came out like little cakes 🙁 whyyy????? Adrienne L: Not good! Things to check: Are you measuring the flower by lightly spooning it into the measuring cup rather then scooping it with the meaning cup? You used butter? Thing to try: Try using a tablespoon or two less flower or a tablespoon more butter. After creaming the butter and sugar well, you don't want to over mix the remaining steps, I mix by hand. Oh man, I just made these and they are divine 🙂 I can't stop eating them! A little cakey like Adrienne's but still definitely a cookie! i used a quarter of the sugar and half the butter, and they were great! I love white chocolate cookies too! I made these following the recipe exactly (but doubling it) and they were insane! Skeptical husband doubted the flavor combination and then promptly at six of them right off the cooling rack. MIL ate at least 4 so that scored me "cookie points." I felt like it needed just a touch of something. Maybe cinnamon or a dash more salt. These are SO good! Next time I would also double it – they didn't last long! I used 1/2 white flour and 1/2 whole wheat. Fantastic – will be making these again for sure. Made two batches of these today. I'm not much for white chocolate, so I had the idea of using Butterscotch chips instead. While I was picking them up, I discovered cinnamon chips existed! Bought some of those to try too. Both batches are quite delicious! The cinnamon chips are a bit more subtle, which works well with the subtle pumpkin flavour. I guess I made mine much smaller, as I ended up with 2 dozen of each.